Sometimes in the hunt for fish tanks, you don’t want one specific size Though someone out there might have their heart set on a 46 gallon tank or a 56 gallon one, you may be a bit more flexible with what you’re willing to buy. And there’s nothing wrong with looking at 30 gallon fish tanks in the form of range of options instead of one solid capacity weight. If you want a moderate size, 25 gallon fish tanks to 34 gallon fish tanks are a solid middle grand before you start getting into larger décor style tanks, though they are bigger than your starter 5 gallon tanks. 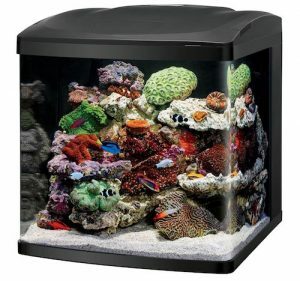 This 30 gallon fish tank size range offers you a lot of freedom. These tanks will be bigger than the small dorm or office size tanks (though you could use any of them in those settings) and you can place them anywhere. You’re going to find some creativity, not just rectangle 30 gallon fish tanks but some more modern and more unique designs as well. 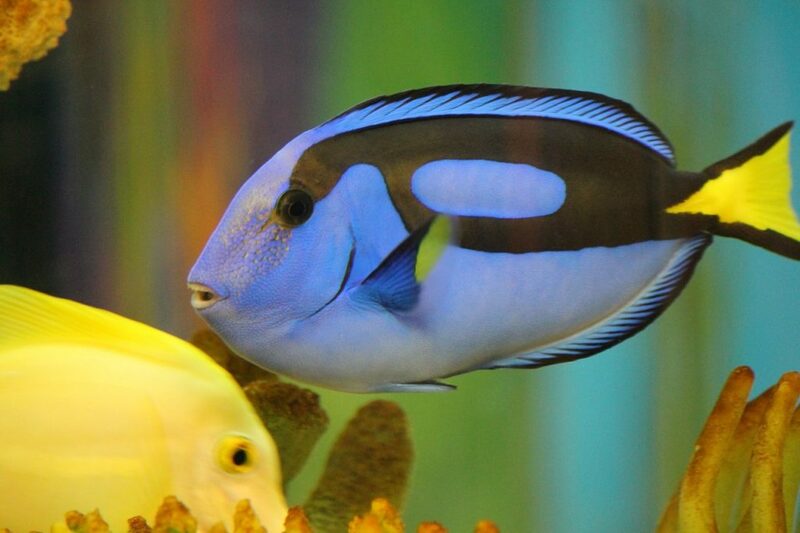 You will also find options for both saltwater fish and freshwater fish (either tropical fish or marine fish). Since this is a spectrum of sizes, that means there’s a lot to keep in mind. Despite them being on the same list, there is a pretty big different between the bottom and top of our list. A few extra gallons that separates the 25 gallon fish tank from the 30 gallon fish tank and from the 34 gallon fish tank is a remarkable difference and can mean even more important details for your fish. 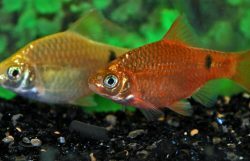 Besides this, you’ll want to take the usual sharp look at the filtration system specs what is recommended as the best fish to house inside your tank. We’re starting off with a traditional design where this 29 gallon fish tank is concerned. It’s a combo set, which means it comes with some things you’ll want such as a reflector and a 24 inch light fixture. It’s a good tabletop starter tank and doesn’t have too many bells and whistles if you want just a straight forward tank to hold your fish and keep them happy. This 29 gallon aquarium measures 30 inches by 12 inches by 18 inches all around and weighs a moderate 20 pounds. It’s easy to move and can fit in virtually any bedroom or open living space. It’s constructed from strong and lightweight acrylic glass, making it pretty impact proof and a great choice for a child’s bedroom or a house with pets. It’s safe for both freshwater fish and saltwater fish (either tropical fish or marine fish) as well, giving you plenty of options for the aquatic world you want to create. The only real drawback here is the lack of additional accessories that aren’t included. But if you just want a tank to start or already have yourself a plethora of accessories, then this is a perfect choice for you. 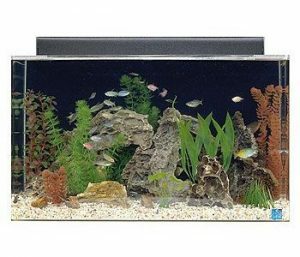 In comparison, this Coralife 32 gallon aquarium features a unique and modern design. It’s more gallons than the previous tank, but the design makes it more compact and easier to fit in smaller spaces such as a living room, an office space or a small dorm room. As the title suggests, it’s a nice, well measured out cube with a modern design to make the world inside pop. This Coralife 32 gallon fish tank measures 20.2 inches by 21.9 inches by 21.5 inches and weighs a fairly heavier 56 pounds. It included LED lighting, which adds to the modern glare on this and includes an automatic 30 minutes sunset and sunrise along with a 60 minute moonrise and moonset setting to mimic the true nature for the fish inside. It includes a built in filtration system and has a quiet, submersible pump with dual intakes and easy to set up mechanical components. The drawback here is that, while the pump is quiet, the fan can be pretty loud. It also doesn’t include accessories and it’s not impact resistant. However, its design makes it easy to place in a safe nook. However, with the louder fan, this might be a choice for the living room where it won’t keep anyone up at night. Just taking one look at this 26 gallon aquarium already shows you how unique it’s design is among others on this list. While it has the traditional tabletop design, it forgoes the rectangle for a hexagonal design to give as much room as possible for your fish to swim and live freely and for you to view the fish inside. 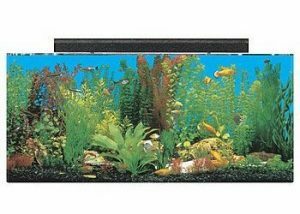 This fish tank measures 36 inches by 12 inches by 16 inches and weighs a moderate 20 pounds. It’s constructed from strong but lightweight acrylic, which makes it impact resistant for high traffic houses or the possible danger of pets and young children. It’s safe for use with freshwater fish or saltwater fish. The hexagonal design makes it a great décor pierce to show off your fish in a common living area. The only real drawback is the lack of other items included with this tank. There’s also no stand included, so if you can find a surface to fit its unique shape, you’re going to have to supply your own stand. Otherwise, it’s a pretty good buy. This is another obviously unique fish tank. This one is a biOrb 28 gallon aquarium and it’s a very unique take on the traditional fishbowl design. It’s got the traditional look of a childhood fishbowl, but constructed with modern elements to ensure the safety and comfort of your fish that those nostalgic bowls don’t offer. So if you want a throwback that’s safe for fish to live in now, this is a great fish tank for you. 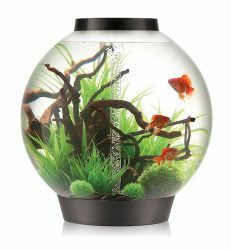 This oddly shaped biOrb 28 gallon fish tank measures 24 inches by 24 inches by 25.5 inches and weighs a very light 5 pounds. It’s constructed out of acrylic for stronger resistant to chipping and impact but a lighter weight and 93% more clarity than what glass provides. It included a filtration system that has 5 stages and accounts for biological, mechanical, and chemical contamination. It’s low voltage, operating on a 12V transformer and included an LED light that replicates a 24 hour schedule. The biOrb Classic Aquarium is also considered a self cleaning fish tank due to its unique multi-staged enclosed filtration system. This aquarium will require less cleaning and maintenance on your part with a slightly higher upfront cost, well worth the investment. This is a lot packed into one tiny tank, so there’s going to be some flaws. The filter on this tank is a little loud and can sometimes get louder over time with use. The light bulb can also burn out after a long period of use. This is another traditional rectangle fish tank design for a 30 gallon aquarium. It’s a pretty straight forward design with an acrylic make for impact resistance and clarity. It works for saltwater fish as well as freshwater fish and the clarity of the glass allows for the fish and plants inside to pop against the blue background that conceals the filtration system. The 30 gallon fish tank dimensions measure 36 inches by 12 inches by 16 inches and weighs a nice 20 pounds. It includes a 24 inch light fixture. It makes for a good tabletop tank that can fit in any bedroom or living room space. The drawback here is the lack of flare, if you’re looking for it. It’s a straightforward 30 gallon long aquarium and doesn’t include any additional accessories. There is also a slight issue of the opening in the hood at the top which includes a somewhat flimsy piece of plastic to cover it when you’re not feeding your fish. You’ve got a lot of options here for a spectrum around the 30 gallon aquariums size, for all your needs. You could go on the lower end of the spectrum or the larger one. It all depends on how many fish you’re keeping, which fish you’re keeping, and where you plan on having this tank reside in your home. Regardless of whether you decide to make it a 30 gallon freshwater aquarium or a 30 gallon saltwater aquarium, any of the sizes listed will work. Many of these large 30 gallon fish tanks for sale are combo kits but for someone who just wants a no frills tank, that’s an option here too, as well as a self cleaning fish tank option. 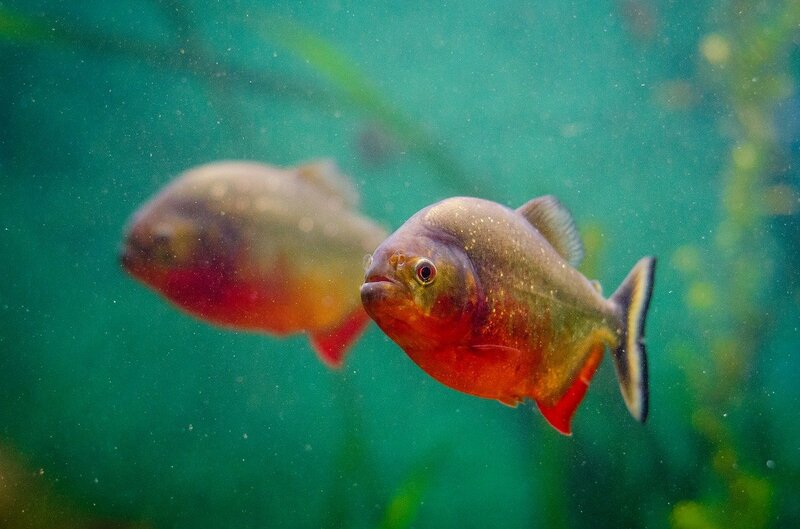 So take a look at this list of the best aquariums around the 30 gallon fish tanks size and do your research to find your perfect fish tank for your home and the perfect home for your fish! Let is know your questions, comments, or concerns in the comments section below and thanks for reading.